Brewers shortstop Jean Segura had a breakout season in 2013 and could be a key player in Milwaukee's rise within the division this year. No team is poised to rise in the NL Central standings more than the Brewers. Yes, part of that is because they are coming off such a lousy season; Milwaukee never came within 10 games of first place after May 19 en route to a 74-88 finish that was the club’s worst since 2004. But there’s another reason the Brewers could be one of the NL’s most improved teams in 2014. They’re loaded with talented players who should be with them for the entire season. Shortstop Jean Segura and center fielder Carlos Gomez enjoyed breakout seasons in 2013, the Brewers’ rotation performed well after the All-Star break and the team got as much out of its rookies as any team north of Busch Stadium. Plenty of work remains, though. The Brewers have a couple of sizable holes to plug before spring training. How they fill them will go a long way in determining how much they close the gap on the Cardinals, Pirates and Reds. Milwaukee won’t be missing much. Right fielder and leadoff hitter Norichika Aoki was traded but that’s about it, at least in terms of productive players. First baseman Yuniesky Betancourt remains a free agent but finding a replacement to better his .595 OPS shouldn’t be too tough. The biggest loss might be the departure to Seattle by first baseman/right fielder Corey Hart, but he missed all of last season because of knee surgery. Lefty starter Chris Narveson, best known to Cardinals fans for slicing his left thumb while working on his glove during a game at Busch Stadium in 2011, signed to pitch in Japan but he worked only two innings for the Brewers last season. Right-handed reliever Burke Badenhop was traded for a Red Sox minor-leaguer and lefty reliever Michael Gonzalez is a free agent and isn’t expected back. Big lefty Will Smith, 6-foot-5, 250 pounds, arrived from the Royals in the Aoki trade to bolster the pitching staff. Smith pitched well out of the bullpen in seven call-ups — yes, seven — last season for Kansas City but could get a shot to make Milwaukee’s rotation. The Brewers took a chance on another lefty, 21-year-old Wei-Chung Wang, in the Rule 5 draft. Wang will be trying to stick in the majors after not pitching above rookie ball for the Pirates last year. The Brewers’ biggest boost should come from the return of PED-scorned Ryan Braun, who remains under contract for seven more seasons at $123.5 million. Of course, Braun has to prove he can be the same impact player he was before his fall from grace. Adding to his challenge will be a position change from left to right field. Juan Francisco is the best internal option at first but his chances to be the regular were best summed up by GM Doug Melvin after the Brewers lost out on Hart and he told reporters, "We’ll get someone." As usual, the Brewers remain in the market for pitching. If they are serious about contending, they need to bring in a proven starter to slot behind Kyle Lohse and Yovani Gallardo. They also are looking for experienced relievers to relieve some of the pressure from closer Jim Henderson, who went 28 for 32 in save chances as a 30-year-old rookie. Manager Ron Roenicke: "We’ve got a nice, solid team. We were talking about how you need to be strong up the middle. We’re certainly really good behind the plate (Jonathan Lucroy). We’re good with Segura (at shortstop), and Carlos Gomez had a great year in center field. Then it comes down to our young pitching and how they do. The starters have shown that they can pitch really well in the majors. But can they do it over a six-month period and then hopefully in the playoffs?" They have their share of "ifs," including "if Aramis Ramirez is healthy" and "if youngsters such as Scooter Gennett can build on encouraging rookie seasons," but the Brewers have a chance to return to contention. To do so, they need an upgrade at first, which has proven more difficult to find than it should be. 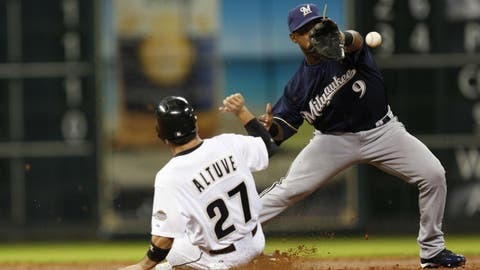 One option that could solve a couple of issues would be moving Rickie Weeks from second base. Owed $11 million for the coming season, he is without a position after losing his job to Gennett. The Brewers want to try Weeks at other positions, but first things first. "We’ve got to get Rick back to where he was," Roenicke said. "When I came over in 2011, before he hurt the ankle, he was a tremendous player, leading off and driving the ball, getting on base, stealing bases. Hopefully, we can get him back."